It has lovely green carpet in the living room. Why is the ugliest carpet always in the best condition??? So for now it stays. I’m going to leave it until green carpet comes back in style. I was stumped on curtains to match the green-ness until I found these table cloths at Target. With a little sewing they made perfect curtains! I love them a million times more now, and so far they’ve held up really well to the beatings of three munchkins. We’ve spent the majority of our summer at the beautiful beaches around us. 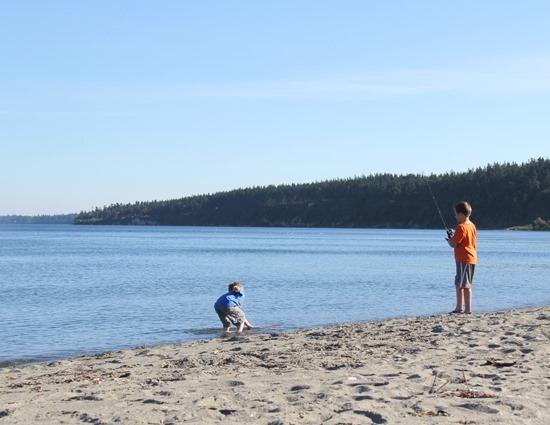 Today my oldest said he was SICK of the beach… i.e. it’s time for school to start. Speaking of school….ours start in 10 days, 6 hours, and 6 minutes. That last photo is the best one-so cute. Good luck in your new home! May your family and home be blessed with health, love, learning, and creativity! Hah, that last photo! Every day at my house, but mine are too young for school. I laughed about the green carpet too… my parents put that exact shade of green all over in the home they built for themselves…. and green tile where carpet wouldn't work. And the outside of the house was painted green, and we had green couches and curtains. Two of the bedrooms had green accent walls too… It was a lot of green! Those curtains are really cheery! Go hawks!! Allison your decorating all looks wonderful! I love the way you labeled your photo of the munchkins! Okay, the last picture. . . last week at my house! Thank goodness school started last week! Oh, and love the chairs!!!! I like that football quilt too. Do you know where I could get that pattern? looks and sounds to me like you have gotten a LOT accomplished this summer. Love the new color of your chairs. 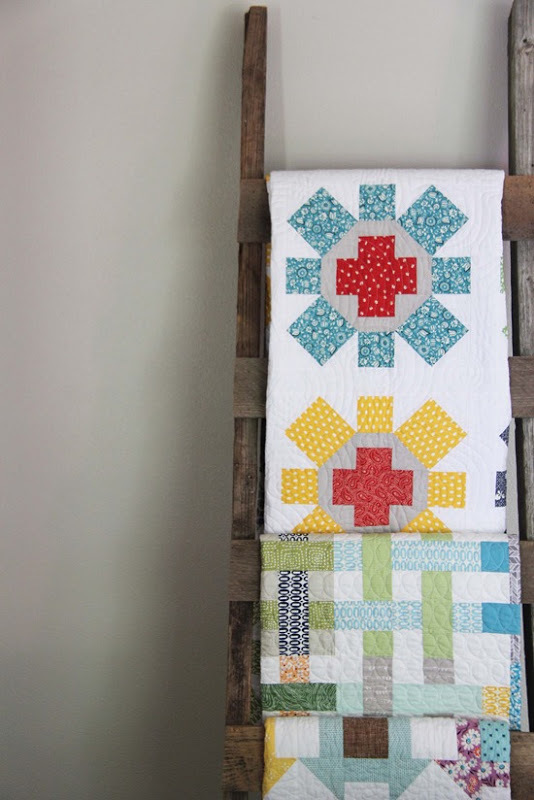 Carla….that quilt is my Touchdown pattern…a fave in my house of football loving boys! Everything looks wonderful, and you just moved a month ago?? We moved across the USA to the state of WA 18 months ago and I am still unpacking! Blessings for Back to School! you home looks lovely plenty of room for the wild ones to be wild! I am on the look out for some old chairs for my kitchen and plan to paint them but thought I would do them all different, love the colour you have used. Definately time foe school if the kids are fed up with the beach, it must be about 9 years since I went to the sea side. Curtains look very nice, I am a green person so wild be happy with the carpet, have just had the kitchen painted bright green and have green in my bedroom too would love to have the lounge painted very pale green but that will have to wait. It could be worse, think brown sculptured. Green carpet is not so bad, I was once told by a carpet salesman that green goes with everything…..grass is green and nothing clashes with grass! Nice home, and I love your chairs. I JUST LOVE YOUR POSTS!!! We have ugly carpet too, it's dark red AND patterned. When we moved in here 13 years ago I thought I would replace it straight away because it is so very ugly, but it's such a good quality carpet that the cheap skate in me can't do it. The worst thing is that it's in my sewing room, and every time I take a picture of a quilt on the floor, there it is in all it's 1980's finery. Bleugh!! 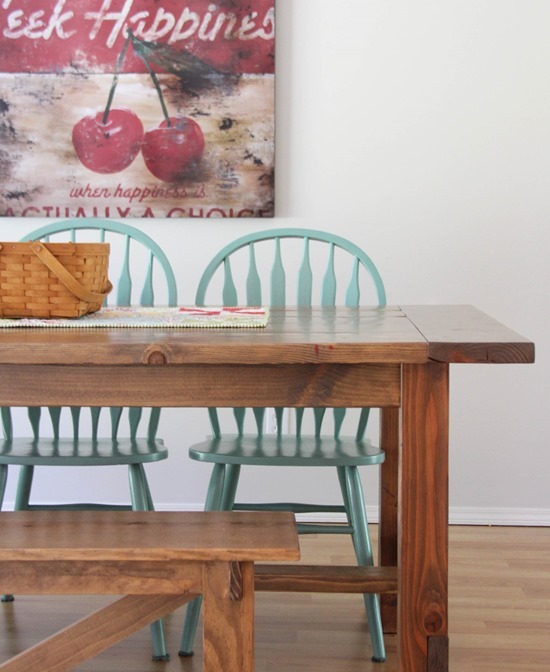 The chairs look great with their new coat, and I LOVE your kitchen table! Care to share where you found it? We started school this past week. It's good to have a routine back in our lives. My son and future daughter-in-law for Christmas two years ago gifted me with painting my well worn dining room table and chairs. I chose the Jade for that project! I love it so much. Now my husband wants to buy a new set and I can't picture anything in our breakfast nook without that color! 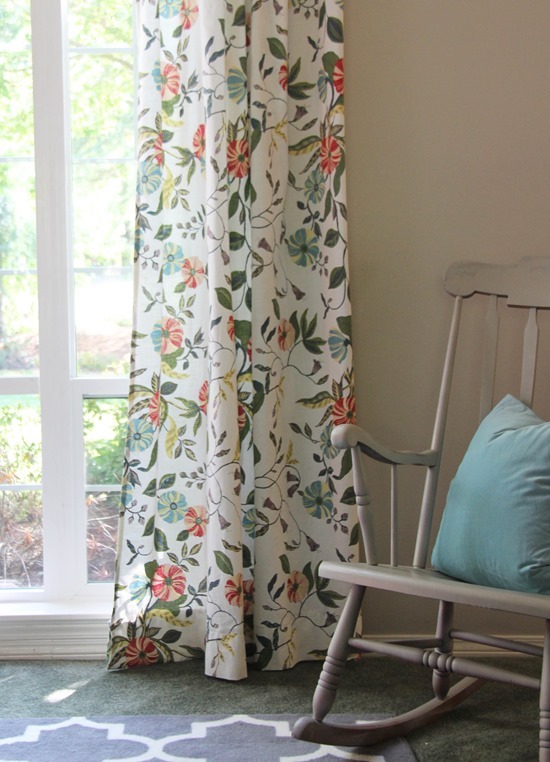 What a great idea you had to use the table cloths for curtains. They're really pretty. I just bought that football quilt pattern yesterday and can't wait to make it!! Have a nice cup of coffee or tea after the kids leave for school – a little "me" time, lol. I had to chuckle when I read about the green carpet in the living room. In our first house we also had green carpet in the living room in like brand new condition that I "affectionately" nicknamed duck-s**t green for its truly horrible shade. It was a long 5 years in that house! Okay! You've convinced me. 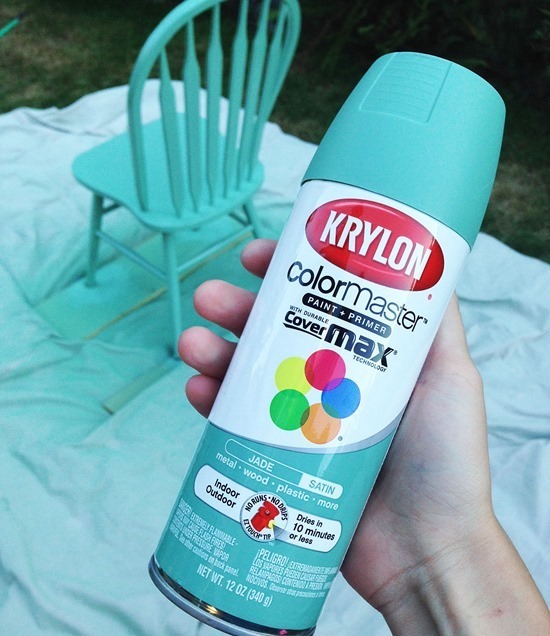 When it's not 100+ degrees out I am going to spray paint all of my chairs!!! YAY!!! You are so funny and I love how realistic and honest you are!! How did you do those pretty curtains? Your house looks so pretty! Enjoy your lovely home, the last of summer, and then, the quiet of kids back at school! Thanks for sharing! Love your blog. Can you tell me about the quilt ladder in the first picture? Did you make it? Allison: I like your style, not just in accessorizing, but in parenting. You allow them to have fun and make memories. No doubt " Mr Wild" was pretending to jump over a raging river or some other hazard… Have fun with them. I can tell that they are well behaved for the most part or you wouldn't have accomplished so much in such a short time since the move! I really don't know how you keep going with everything at once, moving, kids, sewing? We are moving this weekend (first time for me) and I don't have time to even breathe. 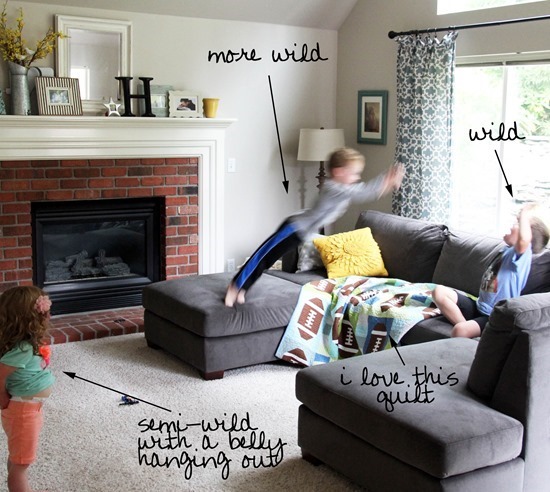 Always LOVE your posts – but this one was extra full of gorgeousness – house and awesome kids! Congratulations on both! Enjoy! I like the sound of the green carpet. When I was a kid, mum bought a house with ancient carpet that had giant floral bouquets on a grey background in her bedroom. She painted the walls a bold green to pick up the green of the leaves and it went from dowdy to glam. Your tablecloth curtains seem like just the trick. Love the green carpet! I have had hunter green carpet in my home since we moved in. I hate it and always have. It's impossible to decorate around, but it was in reasonable condition so I couldn't ever convince the hubs to change it. I completely understand. After exactly 12 years in our home, we are finally carpet shopping, and I'm thrilled! I admit as much as I hate that green carpet, it's completely functional. It hid every single kid-related stain they've inflicted on it. Have fun in the new house! I always love peeks into your home. How fun! It looks like you've made the place a beautiful home. We have the same kind of "ugly carpet" problem but I'm not getting new floors until I'm pretty sure the kids won't ruin them. Love the photo of your wild gang! I really like your mantlepiece, it looks beautiful. Good luck looking after the Wild Things!! Allison, congratulations on your new home! Target tablecloths as drapery panels? GENIUS! Looking at the picture before reading about them, I was already deciding that I loved the fabric and had to ask you where you got it! And the chairs look amazing, too. You have a real gift, girl. My Screaming Cheetah Wheelies started school this Monday at 9:15, and by 10 AM I was at an informal Back To School Cocktail party with some other very relieved moms. Gotta love mimosas on Monday! The house looks great! How many cans of paint did it take to paint those chairs? Just curious, b/c I've been scared it's going to cost me an arm and a leg to use spray paint to paint furniture. But it looks like so much fun too! Now, I must say your "green carpet"
isn't all that bad… at least it's not shag! My folks had some shag carpeting in a home that was really a great quality carpeting… but it was a red they really didn't like but just couldn't justify replacing cause it wasn't worn out. Took them almost 20 years before it was replaced… Embrace the carpet.. So funny! I have the same Target tablecloths as curtains in my living room! Great minds! We had that SAME green – moss greenish but a bit darker – in our house where 5 circus artists plus numerous guests came and went – and NOTHING is a better stain/dirt hider than that colour! Rejoice for you have the perfect juice spill camo!!! LOL. Your house looks great, by the way. I've just found your blog – and am loving it! Thank you for all the tutorials, and quilting tips, and for sharing your beautiful quilts! The middle quilt in the first picture – would you share where I can get the pattern, or what the pattern is called? I'd really love to try making it. The last picture looks like my house :) I love that football quilt too! Do you know where the pattern for that can be found?